11 Commando (11 CMDO) was formed at Kimberley and Gazetted in November 1973. The first intake of NSM's arrived from 9 January 1974. Most of the DTCS Training/Recruit wing Staff were transferred to this new Battalion. A lot more staff were transferred in. As most of recruits were area bound (Farmers, Business owners and essential service members) they would be allocated to Commando's after their initial training, they retained the Commando Beret badge. It was a independent Infantry battalion with Higher HQ North West Command in Potchefstroom. [From Sargent Major Johan Goodrich] On 1 April 1974 the unit's area of responsibility was enlarged by the acquisition of an additional company, stationed at Jan Kempdorp. The Alberton Commando [Afr: Alberton Kommando] was established in Alberton in the Transvaal. As the town of Alberton was only proclaimed in 1909, it follows that the origin of the commando would date to after 1909 sometime as it has been recorded to have been involved in the 1922 Insurrection. During the SADF-period it was organised under the Group 42 Headquarters at Lenz, as part of the Witwatersrand Command, and was responsible for local area protection. It was disbanded with the remainder of the commandos after President Mbeki announced the disbanding of the commando system on 14th February 2003. The Aliwal North Commando was established at Aliwal North on 17 June 1969. The flash comprising of three candle holders each with a burning candle was authorised in 1973. It fell under the command of the Group 39 Headquarets at Queenstown in the Eastern Province Command. The commando was disbanded with other commandos of the group when the Group 39 Headquarters was closed down in 1997. The Barkly East Commando [Afr: Barkly-oos Kommando] fell under the command of the Group 39 Headquarters at Queenstown in the Eastern Province Command. Its well-known yellow flash with he hartebeest head was only authorised in 1986. The commando was apparently not disbanded with the other two commandos of the group when the Group 39 Headquarters was closed down in 1997, as it was later known as the East Border Commando, based at Elliot, under Group 46, at Umtata. This must have happened just before 1997 as the colours of the unit was only authorised under the new name of East Border Commando in early 1997. The Barkly West Commando was established at Barkly West in the Northern Cape sometime between the Anglo Boer War and 1914 as it was involved as a unit in the South West Africa Campaign of 1914, but was not active as an independent commando during the Boer War. During the SADF-period it was organised under the Group 22 Headquarters in Kimberley as part of the Northern Cape Command and was responsible for local area protection. The shoulder flash was authorised in 1977 but the rest of the insignia only in the early 1990s. It was disbanded with the remainder of the commandos after President Mbeki announced the disbanding of the commando system on 14th February 2003. The Belfast Commando [Afr: Belfast-kommando] was established on the farm Tweefontein near Belfast in the Eastern Transvaal (now Mpumalanga) in 1890. It was named after the Capital City of Northern Ireland. Despite the given established date, their registered 'Battle Honours' are Sekoekoeni 1876, Eerste Vryheids Oorlog 1880-81, Modjadji 1890, Maguba 1895, Mpefu 1898 and Anglo Boere Oorlog (Anglo Boer War) 1899-1902. Their first emblem was the 'Crowned Crane'. During the SADF-period it was organised under the Group 28 Headquarters in Middelburg as part of the Eastern Transvaal Command and was responsible for local area protection. The shoulder flash was authorised in 1980. It was disbanded with the remainder of the commandos after President Mbeki announced the disbanding of the commando system on 14th February 2003. The Benoni Commando [Afr: Benoni-kommando] was originally established at Benoni before 1922, as it had been recorded that members of the commando sided with the Miners Strike of the Rand Rebellion. During the SADF-period the comnmando was organised under the Group 16 Headquarters at Marievale, part of the Witwatersrand Command, and was responsible for local area protection. It was disbanded with the remainder of the commandos after President Mbeki announced the disbanding of the commando system on 14th February 2003. The Bloemfontein City Commando [Afr: Bloemfontein Stadskommando (BSK)] can trace its origins back to 1848 when Andries Pretorius raised a Commando of 1,000 men from the Bloemfontein, Caledon River and Winburg areas in the Orange Free State. It operated as an active Boer commando operating against the British forces during the Anglo-Boer War. It was reactivated as a proper commando, the Bloemfontein Commando, in 1948 after a period of inactivity. In 1956 the Bloemfontein Commando was broken up into two separate commandos, the Bloemfontein City Commando and the Bloemfontein District Commando. During the SADF-period the commando did several tours of duty in the Operational Area between 1976 and 1982. It was organised under the Group 35 Headquarters as part of the Free State Command and was responsible for internal security and local area protection during the unrests of the 1980s. The Bloemfontein District Commando [Afr: Bloemfontein Distrikskommando (BDK)] can trace its origins back to 1848 when Andries Pretorius raised a Commando of 1,000 men from the Bloemfontein, Caledon River and Winburg areas in the Orange Free State to chase Major Henry Warden's Cape Riflemen out of the recently established village of Bloemfontein. Later, in 1866, the commando also took part of the actions at Thaba Bosiu (Bosigo) in Basutoland (Lesotho). It operated as an active Boer commando operating against the British forces during the Anglo-Boer War. It was reactivated as a proper commando, the Bloemfontein Commando, in 1948 after a period of inactivity. In 1956 the Bloemfontein Commando was broken up into two separate commandos, the Bloemfontein City Commando and the Bloemfontein District Commando. During the SADF-period the commando was organised under the Group 35 Headquarters as part of the Free State Command and was responsible for local area protection. The Bloemhof Commando [Afr: Bloemhof Kommando] was established at Bloemhof on the banks of the Vaal River in the northwestern part of Transvaal (now the North West Province) prior to the Anglo Boer War and was an active Boer commando operating against the British forces during the war. During the SADF-period it was organised under the Group 20 Headquarters as part of the North West Command and was responsible for local area protection. It was disbanded with the remainder of the commandos after President Mbeki announced the disbanding of the commando system on 14th February 2003. The Bluff Commando was established at Durban on 25 January 1962 as part of the Natal Command. In 1971 it was placed under the command of the Group 9 Headquarters in Pietermaritzburg until 1977 when it was transferred to the Group 10 Headquarters, which was initially located in Smith Street, Durban and later moved to Montclair. In December 1982, the Bluff Commando was disbanded to assist in the establishment of Congella Regiment. The Bo-Nossob Commando was in the SWA Command. The Bothaville Commando was established at Bothaville in the Orange Free State during the Anglo Boer War as an active Boer commando operating against the British forces. During the SADF-period it was organised under the Group 24 Headquarters as part of the Free State Command and was responsible for local area protection. It was disbanded with the remainder of the commandos after President Mbeki announced the disbanding of the commando system on 14th February 2003. The Brakpan Commando was established at Brakpan on 14 January 1922, during the 1922 Rand Revolt, as a rebel commando under "General" R.B. Waterston, to help the striking miners. The rebel commando under a new leader, John Garsworthy, eventually massacred eight mine officials and special constables at the Brakpan Mine before the revolt was crushed. Garsworthy was sentenced to death, but later reprieved. The commando that had started as a Communist rebel movement, was eventually incorporated as a normal commando as part of the Union Defence Force. During the SADF-period it was organised under the Group 16 Headquarters in Marievale as part of the Witwatersrand Command and was responsible for local area protection. The original shoulder flash was authorised in 1969 and a later version in 1973. It was disbanded in 2005 after President Mbeki announced the disbanding of the commando system on 14th February 2003. Calvinia Commando was one of the original Boer commandos dating from before the Boer War. As one of the Cape Commandos, they were not called up for the Rebellion but did serve against the Germans in G.S.W.A. from their mobilisation in October 1914 until May 1915. In Febuary 1915 the Calvinia-Kenhardt Commando was formed out of the following Commandos: Louw's Calvinia Commando., Pretorius' Calvinia Commando., the Kenhardt Commando., and Vermaas's Scouts. During the SADF-period the commando fell under the command of the Group 22 Headquarters in Kimberley, which was part of the Northern Cape Command. The commando was closed down in 2006. The Carolina Commando was established at Carolina in the Eastern Transvaal in 1859, previously having been part of the Lydenburg Commando. During the Anglo Boer War it was an active Boer commando operating against the British forces. In the time of the SADF it was organised under the Group 28 Headquarters at Middelburg as part of the Eastern Transvaal Command and was responsible for local area protection. It was disbanded with the remainder of the commandos after President Mbeki announced the disbanding of the commando system on 14th February 2003. The Cradock Commando's origins can be traced back to 1814, when the town of Cradock was established and a commando formed. Not much is known about the early history of the commando, but members had served in SWA during the First World War when Pte William Frederick Faulds, a mechanic of Cradock, earned the Victoria Cross for his bravety during the fighting at Delville Wood. The commando provided valuable help during the floods of 1974, and established a Civil Defence organisation in the town. By 1982, members of the commando had already served in the Operational Area three times. The commando also established an equestrian platoon which provided additional mobility to the unit during joint exercises with the SA Police during which they would help protect key installations in the area and man roadblocks. In 1980 the commando received the rights allowing free entry into the town of Cradock. The De Mist Commando [Afr: De Mist-kommando] was originally established at Uitenhage as a Town Guard in 1846, in order to defend the town of Uitenhage and the surrounding area. It was soon renamed to Uitenhage Commando [Afr: Uitenhage-kommando] and its first Commanding Officer appointed in December 1856. In 1955 the unit became a fully counter insurgency battalion with reaction capability. The emblem for the Uitenhage Commando was approved in 1973 and soon after it received the Freedom of the town of Despatch. The commando was renamed to De Mist Commando in 1984 and the modified emblem was approved in 1986, which the commando proudly displayed on parade while receiving the Freedom of the town of Uitenhage on 14 June 1986. It was organised under the Group 6 Headquarters in Southdene, as part of the Eastern Province Command. During September 1996 the Headquarters was moved to Despatch. The commando was disbanded with the remainder of the commandos after 2003. The Drakensberg Commando was raised in 1961 in Newcastle as a company of the Dundee Commando. In around 1966 (?) Newcastle split from Dundee and formed the Drakensberg Commando as a separate commando from the Dundee and District Commando, and the unit is said to have became a commando in August 1964. A company did border duty in South West Africa in 1976. It was under command of Group 11 until that Group HQ was disbanded and was then placed under command of Group 27 in Eshowe. The commando saw much duty in the internal unrest of northern Natal. The Dundee and District Commando [Afr: Dundee en Distrik-kommando] was established at Beaconsfield Rd, Dundee, in 1930. It was disbanded in 1941 and officially re-established on 1 Dec 1949. From 1958 to 1965 a platoon was made available to support the SAP at short notice should emergency situations occur. In Sep 1966 Newcastle split from Dundee and formed the Drakensberg Commando and was responsible for the following areas: Dundee, Glencoe, Masinga, Nqutu. A company went up to the SWA Border in 1976. With the shifting of the unit from Dundee to Glencoe, the name of the unit was changed to Dundee Glencoe Commando [Afr: Dundee Glencoe-kommando], with the HQ located at 1 Kommando Street, Glencoe. In 1982 the unit received the Freedom of Dundee and in 1990 the Freedom of Glencoe. In 1991 the unit also received its National Colours. It was moved back to Dundee during 1995. The commando was closed down on 17 March 2006 and a final parade of its members took place through the streets of Dundee on 11 March. Durban South Commando was one of 147 units established in 1949 to replace the defunct Rifle Association system. The unit was officially formed in January 1949 and began recruiting members from all areas south of Berea Road. During the State of Emergency following the Sharpville riots in 1960-61, the unit was tasked with the protection of key points in their area - Mobeni, Jacobs and Montclair. In December 1986 the first National Sevicemen allocated to Commando units were trained and posted to the units. Under the emergency regulations in 1986 the unit had played a leading role in quelling township riots and had increased in size from 160 men in the early 1980's to more than 1200 members. The unit, on occasion, also sent modular platoons to SWA and also patrolled the Northern Natal border areas. It received its colours on 29 June 1991 and was finally amalgemated with Durban South Commando in 1994. The commando had shared the Monastery in Montclair with Gp 10 and Congella Regt. The East Griqualand Commando [Afr: Griekwaland-Oos-Kommando] was established In 1953 with its headquarters based in Kokstad. The Group HQ was Group 9. The headquarters was moved to a boarding school in Cedarville in 1984. The Commando was responsible for the Mount Currie magisterial district. This area was under control of Natal Command from 1930 to 1950 and reverted to Eastern Province from 1950 to 1960 and was returned to Natal Command in 1960. Originally part of the Cape Province, it was transferred to Natal when it was cut off from the rest of the Cape with the establishment of the Transkei as an independent homeland. The East London Commando was originally established at East London in the 1930's (exact date not given but published in 1939 with the English name). The commando was initailly based on Signal Hill on the Eastern Side of the Harbour and was later moved to Woodbrook on the West Bank. The newly established Border Commando (est. 25 Jan 1962) was amalgamated with the East London Commando in 1962. although the Border Commando cloth shoulder title still appeared in an SADF Badge Catalogue of 1970. It was organised under the Group 8 Headquarters as part of the Eastern Province Command and was responsible for local area protection. It was disbanded with the remainder of the commandos after President Mbeki announced the disbanding of the commando system on 14th February 2003. The Edenvale Commando [Afr: Edenvale Kommando] was originally established at Edenvale on the East Rand of the Transvaal (now part of Gauteng Province). During the SADF-period it formed part of the Witwatersrand Command where it was responsible for local area protection, then organised under the Group 41 Headquarters at Primrose, before it was transferred to the Group 42 Headquarters at Lenz. It is not clear when this transfer occurred. Sometime during the SADF period, atb least by 1987, it was upgraded to a full Citizen Force infantry regiment, Regimenrt Edenvale. The Etosha Commando was established as a commando unit the Etosha area. It formed part of Sector 30 in the then South West Africa Command. When the South West Africa Territory Force (SWATF) was formed in August 1980, the commando became the Etosha Area Force Unit. The Gately Commando was established at East London after 1970 (as the commando is not listed in the 1970 SADF Badge Catalogue), with the HQ being situated in a military base on Woodbrook, bordering the industrial area Gately. The commando fell under the command of the Group 8 Headquarters in East London, which formed part of the Eastern Province Command, with its HQ in Port Elizabeth. The emblem for the shoulder flash was duly authorized on 29 February 1984. The commando was later disbanded when the Commando system was shut down and many of its members joined First City Regiment or other Reserve Force regiments. Gatsrand Commando formed part of Group 30, which had its headquarters in Potchefstroom, in the North West Command's area of responsibility. The Grootfontein Commando was established as a commando unit at Grootfontein in 1957 when the local rifle commando was converted into a full commando unit. It formed part of Sector 30 in the then South West Africa Command. When the South West Africa Territory Force (SWATF) was formed in August 1980, the commando became the Grootfontein Area Force Unit. Middelburg Commando (Eastern Cape Province)? Heidelburg Commando was formed in 1851. One of its most iconic commanders was General Christiaan de Wet who farmed near Heidelberg. It fought against the British in the Anglo Boer War and against the rebels during the Miners Strike of 1922. On 8 September 1990 the unit was awarded a new colours by the General Officer Commanding Witwatersrand, Maj Gen W.G. Kritzinger. A new regimental badge was worn for the first time: a castle surmounted by a eagle of the old South African republic to symbolize that at one time Heidelburg was the capital of the Republic. During the SADF-period it was organised under the Group 16 Headquarters at Marievale as part of the Witwatersrand Command and was responsible for local area protection. The Nigel Commando was amalgamated with Heidelberg Commando on 1 April 1997. It was disbanded with the remainder of the commandos after President Mbeki announced the disbanding of the commando system on 14th February 2003. The Heilbron Commando [Afr: Heilbron-kommando] was established at Heilbron in the Orange Free State during the Anglo Boer War as an active Boer commando operating against the British forces. Sasolburg Commando was formed from part of the Heilbron Commando in February 1962. During the SADF-period the Heilbron Commando was organised under the Group 24 Headquarters in Kroonstad as part of the OFS Command and was responsible for local area protection. It was disbanded with the remainder of the commandos after President Mbeki announced the disbanding of the commando system on 14th February 2003. Hercules Commando based in the Pretoria suburb of Hercules. In 1983, the existing elements of the commando were converted into Regiment Pretorius and later relocated to Voortrekkerhoogte. Highway Commando was originally known as Pinetown Commando and as such was the first Commando unit raised in the Pinetown area, although many volunteer forces have been raised in this region since the early Zulu wars of the last century. The initial recruiting drive and formation took place in the Old Pinetown Hall on 22nd October 1963. Companies were later raised in Westville and Queensborough and to fully reflect the regional nature of the unit the name was changed in 1964 to Highway Commando. The Commando was responsible for an area encompassing the municipalities of Westville, Pinetown, New Germany, and Kloof, as well as numerous town boards, health committee areas, townships, and rural stretches between Durban, Botha's Hill and the Umlazi River. On occasion modular companies have been sent to SWA when the need arose. The unit was disbanded after a decision by SA President Thabo Mbeki to disband all Commando Units in 2003. Hillcrest Commando was established in 1962 in Hillcrest, Pretoria as an exclusively English-speaking unit, but on the Minister of defence's insistence that they must speak both official languages, it was decided to "Instead of one tale, our lion will have 2 tales, as the Minister insisted". The commando did some camps in Rhodesia, then became a regiment in 1983, where after It did border camps in the Far North Command. The Hopetown Commando was established in Hopetown in the Northern Cape during the Anglo Boer War as an active Boer commando operating against the British forces. During the SADF-period it was organised under the Group 22 Headquarters in Kimberley as part of the Northern Cape Command and was responsible for local area protection. The Wakkerstroom Commando was to amalgamate with Hopetown Commando on 1 April 1997. It was disbanded with the remainder of the commandos after President Mbeki announced the disbanding of the commando system on 14th February 2003. The Humansdorp Commando was established at Humansdorp in the Eastern Cape. During the SADF-period it was organised under the Group 6 Headquarters in Southdene, near Port Elizabeth, as part of the Eastern Cape Command and was responsible for local area protection. It was disbanded with the remainder of the commandos after President Mbeki announced the disbanding of the commando system on 14th February 2003. Insele Commando was the youngest Commando unit in Natal and was formed on the 1st June 1979 from Umkhombe Commando. In 1987 the unit was evaluated and was awarded the best unit in Natal and was placed third in South Africa. 1981 Saw the Right of Freedom of Entry through Empangeni by the Commando. Through the years the Commando has given much assistance to the South African Police in various tasks, including the period January 1985 - June 1985. National Colours were presented to the unit on 29 September 1990. During the SADF-period it was organised under the Group 27 Headquarters as part of the Natal Command and was responsible for local area protection. Since 1990 the unit has been actively involved in operations of the SAPS and has taken a leading role in the plan to stabilize the area. It was disbanded with the remainder of the commandos after President Mbeki announced the disbanding of the commando system on 14th February 2003. Jacobsdal Commando was established at Jacobsdal in the Orange Free State during the Anglo Boer War as an active Boer commando operating against the British forces. During the SADF-period it was organised under the Group 26 Headquarters as part of the Free State Command and was responsible for local area protection. It was disbanded with the remainder of the commandos after President Mbeki announced the disbanding of the commando system on 14th February 2003. The Karoo Commando was organised under the Group 5 Headquarters in the Southern Cape Command. It was disbanded in 2005 after President Mbeki announced the disbanding of the commando system on 14th February 2003. The Kimberley Commando was originally established in Kimberley in 1936 as the Kimberley Rifle Commando and renamed in 1964. Its headquarters was initially based in the private homes of its commanding officers. In 1964, 1970, 1974 and 1980 the HQ was moved around until It finally shared space with Group 22 HQ at Scanlan Street. From 1976 the unit provided troops for service in the SWA Operational Area. The Kirkwood Commando was established at Kirkwood in the Eastern Province. During the SADF-period it was organised under the Group 6 Headquarters in Southdene, Port Elizabeth, as part of the Eastern Province Command and was responsible for local area protection. The shoulder flash was authorised in 1976. It was disbanded with the remainder of the commandos after President Mbeki announced the disbanding of the commando system on 14th February 2003. It was disbanded on 31 March 2007 after President Mbeki announced the disbanding of the commando system on 14th February 2003. Kruger National Park Commando (KNPC) was based in the Kruger National Park. NKPC was a very small commando with 4 small base camps, Crocodile Bridge, Sandriver near Skukuza, Shishangane near Nwanetsi and a base near Shingwedzi. Masakosapan. Each base more or less platoon strenght with Sandriver as HQ. The main aim was doing daily footpatrols from South to North and catching civilians for there own safety run through the park away from war, or alternatively for the good food and shelter the will get from the SA army while going through the process to be deported back again to Mozambique. The Letaba Commando was originally established at Tzaneen in 1889 as the Lowveld's first commando, and its members took part in the Second Anglo-Boer War which had started in 1899. The commando formed part of the UDF's "Skietkommandos" and were not directly involved in the defence of the country until 1961, when the terrorist threat started and escalated, particularly on the north-eastern border of the Transvaal, from the early 1980s. During the SADF-period it was organised under the Group 13 HQ as part of the Far North Cmnd and was responsible for local area protection of an area of some 330 000 hectares. The area was surrounded by the Kruger National Park, the Soutpansberg Military Area, as well as parts of Lebowa and Gazankulu. It was disbanded with the remainder of the commandos after President Mbeki announced the disbanding of the commando system on 14th February 2003. The Lindley Commando was established in Lindley in the Orange Free State during the Anglo Boer War as an active Boer commando operating against the British forces. During the SADF-period it was organised under the Group 24 Headquarters as part of the Free State Command and was responsible for local area protection. It was disbanded with the remainder of the commandos after President Mbeki announced the disbanding of the commando system on 14th February 2003. The Loskop Commando was established at Groblershoop in the then Eastern Transvaal (now Mpumalanga, more recently part of the Limpopo Province) after the town was proclaimed in 1938. The town had been laid out on the farm "Klipbank" and named after the farm's owner. W.J. Grobler. The nearby Loskop Dam was named after the farm Loskop which referred to the lone hill on the flat veld which was only visible when the water-level of the dam was relativiely low. The dam formed the basis of a large irrigation-scheme which fed the local farming community from which the Loskop Commando would draw its manpower. During the SADF-period it was organised under the Group 33 Headquarters at Nelspruit as part of the Eastern Transvaal Command and was responsible for local area protection. It was disbanded with the remainder of the commandos after President Mbeki announced the disbanding of the commando system on 14th February 2003. The Mafeking Commando was established at Mafeking (now Mafikeng) in 1977 and renamed Goosen Commando in January 1982. The Magdol Commando can trace its origins to just before the Anglo Boer War as the Transvaal Republic became more nervous of its British adversaries in Bechaunaland and Rhodesia. The Waterberg Commando gathered at Nylstroom on 11 October 1899. After receiving news of the outbreak of war, this Commando proceeded to the confluence of the Limpopo and Palala rivers to join with the Soutpansberg Commando, cross into Bechaunaland and destroy railway infrastructure. In the SADF-era, Magdol Commando was originally established as Waterberg North Commando, but was renamed to Magdol Commando in 1972. The unit was situated in the Onverwacht neighbourhood of Ellisras. The Mariental Commando was established at Mariental, in SWA Command. Meyerton Commando [Afr: Meyerton-kommando] was initially established in Meyerton as the De Deur Commando [Afr: De deur-kommando]. It was renamed to the Meyerton Commando on 1 January 1975. The old school building of Laerskool Voorwaarts was used as its headquarters from 1982 and received its Freedom of Entry to Meyerton on 10 April 1984. The unit exercised it right to the freedom of Meyerton when it marched through the town as part of the "Groot Trek" remembrance celebrations on 26 November 1988. During the SADF-period it was organised under the Group 17 Headquarters at Vereeniging, as part of the Witwatersrand Command, and was responsible for local area protection. It was disbanded with the remainder of the commandos after President Mbeki announced the disbanding of the commando system on 14th February 2003. The Middelburg Commando was established at Middelburg, in the Transvaal. While the Modderfontein Commando's origins can be traced back to before World War 2, it was officially only formed at Modderfontein in 1969 as a normal Urban Commando of the SADF. It resorted under the Group 18 HQ, at Doornkop, until at least 1982, after which the unit was placed under the command of the Group 42 HQ, at Lenz. In early 1980 the Commando was converted into the first fully fledged Industrial Commando with the task of protecting the massive sprawling complex that made up AECI's Modderfontein Dynamite Factory, at the time the biggest manufacturer of explosives in the world. Manpower was largely drawn from men working for AECI who had a military commitment, and were backed up by volunteers from other sources. The Commando had a HQ Company and four large Companies, which were supported by a small full time element that ran the administration and logistical needs of the unit. The Northern Natal Commando [Afr: Noord Natal Kommando] was established in 1948 after the Defence Rifle Association had been disbanded. The newly formed unit was then called "Noord Natal Skiet Kommando". The Headquarters of the unit was at that stage based in Paulpietersburg and the area covered included Paulpietersburg, Vryheid, Utrecht, Groenvlei, Swartfolozi and Dannhauser. In 1960 the Headquarters were shifted to Vryheid and on 12 December 1977, the headquarters were shifted to Landdrost Street. The present Headquarters was occupied in 1985 and resorted under the command of the Group 27 Headquarters at Eshowe, part of the Natal Command. The Otjiwarongo Commando was established as a commando unit at Otjiwarongo in 1957 when all the local rifle commandos were converted into full commando units. It formed part of Sector 30 in the then South West Africa Command. When the South West Africa Territory Force (SWATF) was formed in August 1980, the commando became the Otjiwarongo Area Force Unit. Ottosdal Commando was established as a commando in 1952 and formed part of the then Western Transvaal Command which later became the North West Command, based in Potchefstroom. During the later SADF period the commando fell under the Group 20 Headquarters at Mmabatho. The local community formed the core of the unit with some 85% of the members all being local farmers and some 92% volunteers (in 1982). All the officers of the unit were volunteers as well. This unit was disbanded after a decision by South African President Thabo Mbeki to disband all Commando Units in 2003. 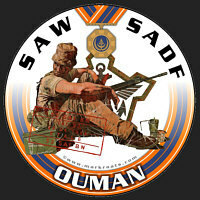 Originally part of the Northern SWA Commando, the Outjo Commando was established as an independent commando unit at Outjo in 1957, when all the local rifle commandos were converted into full commando units. The original commando it had been part of disapperared in favour of a number of independednt commandos. Since 1967 the unit has been involved in the fight against terrorisim on a full-time basis, with permanently appointed key personnel supplementing the mostly local farmers that served on a voluntary basis. It formed part of the SWA Command, and was responsible for the protection of people, property and vulnerable key points, as well as manning of roadblocks, the gathering and reporting of intelligemce about terrorist activities in the area and the locating and destruction of the enemy. When the SWATF was formed in August 1980, the commando became the Outjo Area Force Unit. Parys Commando [Afr: Parys-kommando] can trace its history to before the Union of South Africa in 1910. Initially known as the Vredefort Commando [Afr: Vredefort-kommando], the name was changed to North Free State Commando [Afr: Noord-Vrystaat-kommando] in 1967. In 1972, the name was finally changed to Parys Commando. It received the Freedom to Parys in October 1980 because of its role in securing the town. In February 1985 an old Sexton-self-propelled gun was given to the commando by the SADF to use as a monument. During this period it was organised under the Group 24 Headquarters at Kroonstad, as part of the orange Free State Command, and was responsible for local area protection. It was disbanded with the remainder of the commandos after President Mbeki announced the disbanding of the commando system on 14th February 2003. Piet Retief Commando can trace its origins back to 1880, fighting in the First War of Independence and battles such as Laingsnek and Majuba. In May 1902 the Commandos were disbanded, but with some remaining until the emergence of the Union Defence Force in 1912. Defence Shooting Associations were formed, and in Mar 1916, a number of these Associations formed the Piet Retief Commando, the official establishment of this commando. With the onset of World War 2 a number of the commandos were joined together to form Mounted Commando Brigades, consisting solely of volunteers, soon disbanded and replaced by National Reserve Volunteers which, upon returning to the Union in 1946, was also disbanded. After the war the Piet Retief unit became independent. During the SADF period, the unit resorted under the Group 12 Headquarters of the Eastern Transvaal Command. It was disbanded with the remainder of the commandos after President Mbeki announced the disbanding of the commando system in 2003. This unit could trace its origins back to a Natal Law for the protection of the colony, namely Law No 19 of 1862 which instructed the establishment of a rifle association. The name of this rifle association was changed during the UDF era to the Pietermaritzburg Commando (Maritzburg Rifles?). By the 1940s, the commando was headquartered at the Pietermaritzburg Drill Hall and was shared by another unit during that era, namely the Natal Carbineers. In 1981, the commando was converted to a regiment as an infantry battalion under the Citizen Force, being renamed as the Natalia Regiment. The Piketberg Commando was authorised on 20 November 1975, established at Piketberg under the Group 40 Headquarters at Wingfield, in the Western Province Command. Plans were to amalgamate it with the West Coast Commando on 1 April 1997. The Pongola Commando [Afr: Pongola-kommando] was established on 13 August 1970 by combining the Piet Retief Commando and the North East Commando, with its headquarters next to the Magistrates Offices in Pongola, in the Natal Command. Pongola Commando was unique in the sense that it consisted of a piece of Transvaal and Natal which caused a lot of liaison problems with the SAPS and other Departments. During 1979 and 1980, the unit sent volunteers to the South West African border. As from 1987, Pongola Commando was placed under command of Group 27 from the former Group 11. It was disbanded with the remainder of the commandos after President Mbeki announced the disbanding of the commando system on 14th February 2003. Potgietersrus Commando was probably originally established as Geyser's Commando in Potgietersrus in the northern Transvaal as early as 1914, although members of Potgietersrus have been part of local commandos since at least 1854, one such commando being the Zoutpansberg Commando. This local commando had seen action during the 1914 Rebellion and was known as the Potgietersrus Commando by 1925. During the SADF-period it was organised under the Group 14 Headquarters as part of the Far North Command and was responsible for local area protection. It was eventually amalgamated with Springbokvlakte Commando but retained its name. It was probably disbanded with the remainder of the commandos after President Mbeki announced the disbanding of the commando system on 14th February 2003. The Pretoria East Commando was established in Pretoria in the Transvaal. The Queenstown Commando fell under the command of the Group 39 Headquarters at Queenstown in the Eastern Province Command. The commando was probably disbanded with the other two commandos of the group when the Group 39 Headquarters was closed down in 1997. The Riversdal Commando was organised under the Group 4 Headquarters at Oudsthoorn, in the Southern Cape Command. It was probably amalgamated with the Mossel Bay Commando in 1997 as part of the new Langeberg Commando, and was probably disbanded with the remainder of the commandos after President Mbeki announced the disbanding of the commando system on 14th February 2003. The Rustenburg Commando was established at Rustenburg in 1852, when Paul Kruger, later to become the first President of the ZAR, became its first Commandant. The commando distinguished itself in the First War of Independence by besieging a British garrison. Members of Rustenburg Commando served in the Second War of Independence (the Anglo-Boer War) at Kimberley, Mafeking (now Mafikeng), Kraaipan, Vaalkrans and Pieters Hill. During the rebellion of 1914/15 the Rustenburg Commando members served on the side of both the government and the rebellion. and in World War 1 during the campaign in German South West Africa, 1914-15. In later years the commando was responsible for hearth and home protection in the area. Between 1976 and 1978 various Companies of the Commando saw service in the Operational Area. It received its colours on 20 August 1982 from the former Vice State President, Mr A.L. Schlebusch. Rustenburg Commando laid up their colours in the museum at Infantry School in Oudtshoorn on 31 October 2007. The Sandrivier Commando was established at Henneman in the northern Orange Free State. During the SADF-period it was organised under the Group 24 Headquarters as part of the Free State Command and was responsible for local area protection. It was disbanded with the remainder of the commandos after President Mbeki announced the disbanding of the commando system on 14th February 2003. The Sandton Commando was founded in 1962 as the Westpark Commando, one of four English-speaking groups in the Johannesburg area to be formed at that time. Since 1976, members of the Commando have volunteered and served with other operational units to combat terrorism. The commando was only renamed to Sandton Commando around 1987 even though the new suburb of Sandton had already been established in 1969. It was disbanded with the remainder of the commandos after President Mbeki announced the disbanding of the commando system on 14th February 2003. The SASOL Commando [Afr: Sasol-kommando] was formed from workers from the refinery to protect the installations of the South African Coal Oil and Gas Corporation (SASOL) as they were already trained in the safety protocols and how to handle the inherent dangers involved. Members from the Heilbron Commando was used to form the commando on 14 February 1962. Its first permanent HQ was opened in May 1975, and the commando worked closely with Regiment Sasolburg on external threats to the refinery. The Skiereiland Commando (also known as the Peninsula Commando) was organised under the Group 1 Headquarters at Youngsfield, in the Western Province Command, and formed part of the Commando System as a whole, which was a mostly voluntary, part-time force of the South African Army, often deployed in support of and under the authority of the South African Police. It was disbanded with the remainder of the commandos after President Mbeki announced the disbanding of the commando system on 14th February 2003. The Stellaland Commando was mobilised at Vryburg in 1899. In 1913, Rifle associations were combined to form a commando. Incorporated into the SADF in 1957, it was tasked with rear area defence in 1961. During the Bush war in SWA, it combined forces with the Kalahari, Bloemhof, Christiana, Schweizer-Reneke and De Ka Reyville Commandos to form a company of volunteers that were deployed to the Ovamboland region. The Stellenbosch Commando [Afr: Stellenbosch Kommando] can trace its origins as far back as 1870 when Commandant Frederick Potgieter assembled a commando without orders to recapture the cattle carried of by the Xhosas that had crossed the Fish River. During the SADF-period the commando was organised under the Group 2 Headquarters as part of the Western Province Command and was responsible for internal security and local area protection. It was eventually disbanded with the remainder of the commandos after President Mbeki announced the disbanding of the commando system on 14th February 2003. Swellendam Commando can trace its origins back to around 1795 with the Republic of Swellendam and the unsafe situation for farmers on its eastern border with Xhosa tribes. An independent republic had been declared from the Dutch East India Company, declared with a National Assembly and Hermanus Steyn as president. It was a momentous event, but at the same time the British occupied the Cape and the new republic was called on to assist in battle. The republicans refused initially, but a commando of 70 soon left for the Cape. By 1806 with the Second British Occupation, at the Battle of Blaauwberg (6 January 1806), the Swellendam Commando again held the British off long enough for the rest of the Batavian army to retreat to safety. During the SADF-period the Swellendam Commando was organised under the Group 2 Headquarters in the Western Province Command. It was disbanded on 31 March 2008 after President Mbeki announced the disbanding of the commando system on 14th February 2003. Tugela Commando was established in Eshowe, Natal in 1964. The first location of the HQ was in the Star Theatre, but in 1966 the HQ moved to its present premises, the Old Prison Building in Eshowe. In 1983 the Freedom of the Town of Eshowe was bestowed on Tugela Commando. During the SADF-period it was organised under the Group 27 Headquarters as part of the Natal Command and was responsible for local area protection. It was disbanded with the remainder of the commandos after President Mbeki announced the disbanding of the commando system on 14th February 2003. The Uitenhage Commando [Afr: Uitenhage-kommando] was originally established at Uitenhage as a Town Guard in 1846, in order to defend the town of Uitenhage and the surrounding area. It was soon renamed to Uitenhage Commando and its first Commanding Officer appointed in December 1856. In 1955 the unit became a fully counter insurgency battalion with reaction capability. The emblem for the Uitenhage Commando was approved in 1973 and soon after it received the Freedom of the town of Despatch. It was organised under the Group 6 Headquarters in Southdene, as part of the Eastern Province Command. The commando was finally renamed to De Mist Commando with new emblems in 1984. Umgeni Commando was established in October 1963. The name "Umgeni" was chosen by Natal Command due to the area from where members were to be recruited i.e. between the Umgeni River in the North and the Umbilo River in the South. The commando's first "home" was with the Natal Mounted Rifles in NMR Avenue. In 1965 the unit moved from Natal Mounted Rifles to Lords Ground in Old Fort Road. In 1972 the unit moved once more, this time to Shepstone Road in Durban's Point area into the building that used to be the old Indian and Bantu Fever Hospital where it remained until October 1982, when it moved to the Old Central Police Station building in Smith Street, Durban. During 1980 Umgeni Commando completed two tours of duty in operational areas. In July 1980, Umgeni made its first tour to the SWA Operational Area as a composite company with the Bluff Commando. Vanderbijlpark Commando originated as a shooting commando in 1953 when it divided from the Vereeniging Commando, and was formally militarised in 1961 when all members received their Force Numbers and placed in companies. From 1961 to 1969 the unit was responsible for the security of Vanderbijlpark and ISCOR, the Iron and Steel Corporation of South Africa facilities. The unit conducted its first border duty during 1976 and received a new headquarters on 9 September 1978. It was organised under the Group 17 Headquarters at Vereeniging as part of the Witwatersrand Command and was responsible for local area protection. The unit was officially reclassified a regiment on 31 January 1986, and received the Freedom of Entry to Vanderbijlpark on 20 February 1982. The Vereeniging Commando [Afr: Vereeniging-kommando] can trace its roots back to the Anglo Boer War as part of the Heidelberg Commando, but was first formed as a separate unit, namely the Vereeniging Skietkommando, in 1921. In 1957 all skietkommandos officially became part of the SADF and it was renamed to Vereeniging Commando, based in Vereeniging, with the first Citizen Force members joining the commando in 1961. The Freedom of the city of Vereeniging was awarded to the unit on 14 February 1976, when 500 members of the commando marched through the streets of the city. The headquarters of the commando was moved to the town centre in 1982 in order to protect the trade centre. It received its Colours on 14 May 1991 at a coordinated colours parade hosted by 1 Construction Regiment. The commando formed part of the Witwatersrand Command, first as part of Group 17 (at the Vereeniging Military Base and later at Lenz), and then as part of Group 18 (at the Doornkop Military Base). The Weenen Klip River Commando originated from the 1887 Estcourt and Ladysmith Rifle Associations and the later raised Ladysmith Town Guard (1899). 1913 saw the phasing out of the Rifle Clubs, but a Defence Rifle Association was formed and commandeered for war service. It was renamed to Weenen Klip River Commando on 16th Dec 1948 and comprised the magisterial districts of Kliprivier, Bergville, Estcourt, Weenen and Mooirivier. On 1 Jul 1979 the Mooirivier district was transferred to the newly formed Midmar Commando. The Commando HQ were adjacent to 5 SAI Bn in Ladysmith, and its area of responsibility extended along the Natal border from the Natal/Qwa-Qwa border, and south along the Lesotho border for approximately 138 km up to the Weenen / KIiprivier- Midmar Commando boundary at Giants Castle. The Welkom Commando was eatsblished at Welkom, renamed to OFS Goldfields Commando on 30 March 1963, then again renamed back to Welkom Commando on 2 January 1985. Wemmer Pan Commando [Afr: Wemmerpan-kommando] was established at Wemmerpan, an old gold mine in the southern suburbs of Johannesburg, on the 3rd of July 1962, where it was activated for the first time on 1 March 1963 under the command of Capt E.W. Merzbacher. The commando performed its first border duty in 1976 and laid up its National Colours at the South African National Museum of Military History.on 26 April 1994, and was finally disbanded with the other sommandos between 2003 and 2008. The Wynberg Commando [Afr: Wunberg Kommando] was established in Wynberg, Cape Town, and organised under the Group 1 Headquarters at Youngsfield, as part of the Western Province Command and was responsible for local area protection. It was renamed to Wynberg Battalion [Afr: Wynberg Bataljon], probably around 1989 and was eventually disbanded with the remainder of the commandos after President Mbeki announced the disbanding of the commando system on 14th February 2003.